Are the pictures of the Gurus real? If not, then why do we hang them up? Sikhism rejects any form of idol worship including worship of pictures of the Gurus. Artists renditions depicting Sikh history are for inspirational and educational purposes only and should not be regarded as objects of worship themselves. However, these pictures for educational or inspirational purposes should be not hung in the main hall of the Gurdwara where Guru Granth Sahib Ji is present. Instead they should be hung in a separate hall or museum. Depicting the Sikh Gurus in pictures can become problematic. It’s a double edged sword because paintings illustrating Sikh history and Saakhis can excite and rouse the spirit of Sikhi within those people who perhaps otherwise would never pick up a book on the Sikh faith. However, it would be Manmat (contrary to the Guru’s teachings) for people to hang flower garlands or burn incense in vicinity of pictures or illustrations. Sadly that is the general direction many people have taken with Sobha Singh’s work because he focused almost exclusively on the faces of the Gurus. So any paintings or drawings that are made should focus on projecting Saakhis and history of the Sikh nation. There has to be a balance between in putting the necessary aesthetics to create a strong painting but not so much that it becomes an idol in itself. According to the Sikh principles, not the physical features of his body, but the words said by the Guru are the â€˜Guruâ€. Lessons given in the sacred Gurbani are the â€˜Guruâ€™. A disciple who obeys Gurbani, will surely achieve the goal of human life. The Sacred Hymns revealed through the Gurus, Bhagats, and other Divine Saints, were compiled and installed as ‘Shabad Guru’ (The Word Guru) in Sri Harmandar Sahib (commonly known as the “Golden Temple”), Amritsar. No pictures or idols of the Guru (none were there), were allowed to be placed in the buildings or depicted on its walls. For making the environment aesthetic and soothing to the mind, flowers, geometrical figures and other artwork was engraved on the walls of the Golden Temple. Pictures and paintings of the Gurus are conspicuous by their absence. One wonders how the false pictures of the Gurus and even their plastic, wooden and metallic idols appeared, not only in the houses of the Sikhs but also in many Gurdwaras. This is nothing but from the Sikh houses and their places of worship. It can easily be known from the historical records as to how fake pictures and then statues of the Gurus entered the Golden Temple and Sikh houses. What seems to be extremely difficult is, how to remove them out of the Gurdwaras and the Sikh psyche. Not only a few credulous Sikhs, some traditional preachers and even a few educated Sikhs have started believing in Guru pictures. They think that keeping pictures of the Gurus in the house is the Gurmat method of showing respect to the Gurus and obeying their blessings. Some Sikhs have seen garlanding the Guru pictures and serving food to them for ‘Bhog’, a practice prohibited for the Sikhs. Not all Sikhs, of course, have reached the stage of worshipping the Gurus’ pictures/paintings as the Hindus worship their idols, but a large number of them are on their way to do that. Some scholars want these pictures (all are surely fake) to be destroyed whereas others suggest that only their worship be prohibited. (ii) The history of the imaginary Guru pictures is briefly stated below. The Keshdhari Sikhs during the 18th century were forced to leave the villages and live in the forests, the non-Keshadhari disciples and sympathisers of Sikhism took care of the Sikh Gurdwaras and the historical places. These disciples did not board the ship of Sikh Faith; they only held it in their hands but kept their feet stuck in the Hindu Boat. The Brahmanical influence, which was still holding their mind, obliged them to depict popular mythological scenes on the walls of the Gurdwaras as they were traditionally depicted on the walls of Hindu temples. When the pictures of the Hindu gods and their consorts appeared on the Gurdwara walls, the pictures of the Gurus had also to appear as a natural sequence. All pictures, of course, differed and were subject to the imagination of the painters. The pictures from the walls moved on the paper and were printed in large numbers to reach every Sikh house and every Gurdwara. Only a few vigilant managers did not permit any kind of pictures, howsoever ‘genuine’ or ‘superior’ they were claimed to be, to come even near the boundary of the Gurdwaras. Once the pictures of the Gurus were accepted as ‘true’ and ‘good’ by the masses, how could anyone stop them from taking the form of idols and statues? Unfortunately, it appears that they are here to stay at least for the time being. During the 18th century, not only the non-Sikh but anti-Sikh rituals were practised in Gurdwaras without any objection because the Khalsa had moved to the forests. The sacred places were managed by the ‘Sanatan (Brahmanical) Sikhs’ or by those Mahants who still believed in Hindu rituals even after associating themselves with the Sikh faith. When the Sikhs lost their Raaj in Panjab in 1849, they had time to turn their thoughts towards their faith. They were surprised to find Sikhism already pushed out of the Gurdwaras by Brahmanical rituals. The worship of idols, whether of the Hindu gods or of the Sikh Gurus, is prohibited for the Sikhs. However, both were worshipped by the Sikhs in the precincts of the Golden Temple. No true pictures of the Guru exist, though some have been claimed to be true pictures. One ‘true’ picture is totally different from the other ‘true’ picture. Most of them are modern paintings. Some old sketches / paintings are also available, but all are based on the imagination of the painters. No Guru permitted his painting to be made in his time, because it is against the philosophy of the Sikh faith as mentioned earlier. We should not have Guru pictures in our houses or Gurdwaras. Instead we should have Gurbani hymns written and hung for our guidance in our house. Bending/bowing before the pictures or garlanding them is prohibited even if they were true pictures. The Sikh philosophy tells that ‘words’ said by the Guru are the ‘Guru’ (now Guru Granth Sahib Ji). We bow not before a book, as some persons think, but to the ‘Brahm Giaan’ (Divine Knowledge) and Shabad-Jyot (Divine-Light of God within the revealed Word) therein. 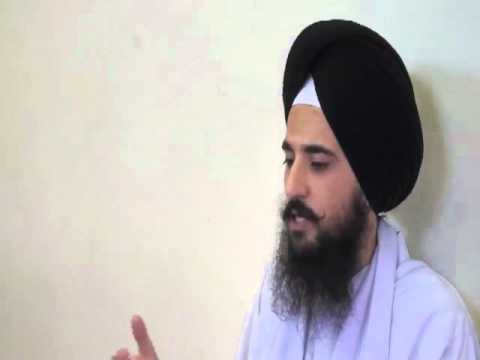 « What is the Sikh Rehat Maryada?